Pontos Requerido: 3050 Os jogos não são compatíveis com dispositivos móveis e tablets. Por favor adicione este título à sua Lista de Desejos e inicie a sessão na sua conta the first club desde um computador para concluir o processo de solicitação. NOTICE: Activation key must be used on a valid Steam account, requires internet connection. ABOUT THE GAME	Action-packed artillery game featuring CRAZY CHICKEN at its best! Finally, CRAZY CHICKEN strikes back! Get set, aim, fire... and never neglect your own cover. Fight against the virtual opponents, your friends or your enemies! Pure CRAZY CHICKEN action!CRAZY CHICKEN returns to its Scottish … residence only to find that an unpleasant Clan Chief has made himself at home there in its absence. This shady character has abducted a maiden, and CRAZY CHICKEN begins its adventurous quest to rescue her. A battle for territory and castles begins - and for the fair maiden, of course!The game features an extensive single-player campaign, as well as several multiplayer options - for all gamers who enjoy competing with real-life opponents as well.Cross-platform Multiplayer	CRAZY CHICKEN strikes back can be played offline and live against the computer, friends and enemies. Furthermore you might challenge opponents on different devices and platforms and take loot from them, because this PC game is also available for Amazon Fire tablets, iOS and Android smartphones and tablets. Everybody can play against anyone!Single-player	Fit out the seat of your clan to build a mighty and prestigious fortress, and upgrade it continuously with better weapons and defense facilities. Pursue the evil Clan Chief from one battle to another, and grow stronger and more powerful. You start out with a small shack, but you will soon be able to improve and expand each element of your residence. Eventually, you will become the lord of an extensive castle, able to withstand heavier attacks.Live multiplayer Play fast, action-packed live duels against your friends or random opponents from all around the world. Just agree on a password, and you are ready to play - across different devices and platforms. 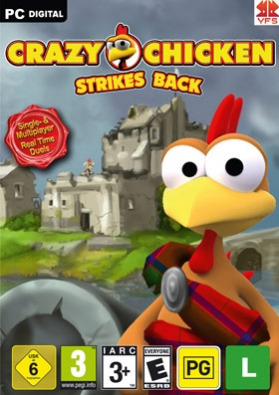 It's simple and without any registration.Looting Catch your opponents off-guard by attacking and stealing from them whenever you want.Community	With more than 15 million copies sold, CRAZY CHICKEN (AKA Moorhuhn) is the best-known and most successful German game character. With CRAZY CHICKEN strikes back, the Chicken opens a new chapter and hits the charts once again. Join the large Crazy Chicken community! Follow us on Facebook and post your victories.CRAZY CHICKEN speaks English, French, Italian, German, Dutch, Spanish, Portuguese, Brazilian Portuguese, Japanese, Polish, Russian, Greek and Turkish. KEY FEATURES The multiplayer mode requires a network connection. Action: Aim and hit with a variety of weapons and magic! Construction: Build your own castle complete with walls, shields, towers, cannons, catapults, or mighty mages! Single-player: Pursue the evil Clan Chief and defeat him in epic battles! Multiplayer: Compete against players from around the world and win gold and trophies across all platforms. Live duels: Challenge your friends directly and fight for glory... and gold!SYSTEM REQUIREMENTS OS: Windows 7 or higher CPU: Intel® Core2 Duo E6300; AMD Athlon® X2 Dual Core 3800+ or higher Graphic card: GeForce 9800; Radeon HD 5570 or higher (DirectX 9 with at least 512 MB memory) RAM: 2 GB HDD: 1 GB Soundcard; Keyboard; Mouse; Optional: Internet connection © 2016 Young Fun Studio, Protarius Vertriebsges. mbH, all rights reserved. Moorhuhn and Crazy Chicken is a registered trademark of ak tronic Software & Services GmbH. The character of the Moorhuhn is based on a graphical work of Ingo Mesche from the year 1998.